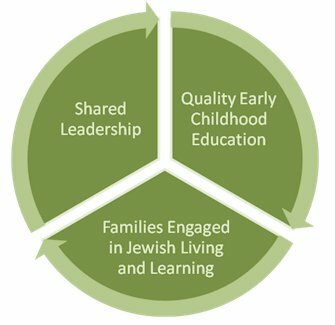 JECEI: the Jewish Early Childhood Education Initiative is now a permanent Web resource, free and accessible to schools, synagogues and other host institutions, educators and parents who are interested in strengthening the quality of both the Jewish and secular education offered to young Jewish children. We are no longer offering staff-based, direct services; nevertheless, our commitment to the field of Jewish early childhood education continues. All of our research, curricula, tools and materials are embedded in this site and available for use by organizations wishing to adopt parts or all of the JECEI approach to Jewish early childhood education. JECEI was founded in 2004 with a clear vision and mandate to increase the number of families sending their children to high quality Jewish early childhood schools and inspire them to become involved in Jewish life both during and long after the early childhood education experience ends. Our model has been validated in peer-reviewed academic articles and by independent research. We have already put 6,000 families, 8,000 children and 1,000 teachers on a path toward excellence in Jewish early childhood education and family engagement. While JECEI is no longer staffed or playing a service provision role, our materials can assist you in creating centers of excellence in Jewish early childhood education. JECEI has uploaded its key research and documentation and created links to other Jewish ECE Resources. The site is organized around the three pillars: 1.) quality Jewish early childhood education, 2.) Jewish living and learning by families and in the classroom and 3.) shared leadership, so that you can focus on strengthening any one of the areas and find information and documents that can help you employ JECEI strategies. There are additional sections including: "About Us " which includes the JECEI history, lenses, logic model, principles and, change model. Another is "Impact of JECEI Self-Study, Evaluation and Fund Development." These sections include the specific resources ranging from self study documents to surveys of educators and parents and a sample fund development proposal. Last, there is a Publications section, which contains the all of the JECEI documents on the Web site.